At one top kids baseball program in Tokyo, gender roles are strictly prescribed and moms exist to serve. 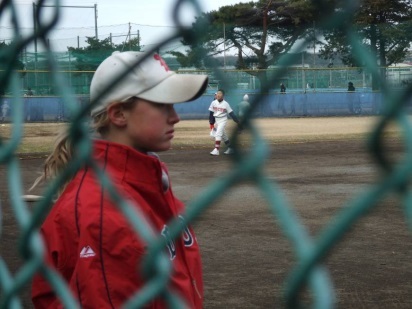 Know your place: While girls can join and thrive at the Musashi Fuchu Little League team in west Tokyo, their mothers' roles are mostly limited to keeping players and the men fed and watered while fathers tend the sacred field. I have never been to Koshien, but its legends have had a prominent place in my life. In the ’90s, my favorite way to experience the high school baseball tournament, held each year at the Hanshin Koshien Stadium, was watching with my husband at a ramen shop in the August heat. Half the pleasure was observing other fans glued to the little TV set hanging in the corner. But now, 25 years later, I watch through the lens of my 12 years with Musashi Fuchu Little League in west Tokyo. First my daughter and then my son played for this legendary program that has produced two Little League World Series champion teams. In 2014, Musashi Fuchu Little League celebrated its 45th year. On the morning after a very grand celebration to mark the achievement, I heard a news story about Somayya Jabarti. The news made me smile. Not a sneering smile, but certainly more sneering than elated. Ms. Jabarti had just been appointed the first female editor-in-chief of a major Saudi Arabian newspaper, the Saudi Gazette. Amazing really: In Saudi Arabia women are not allowed to drive; they often occupy spaces that are literally segregated from men — physically removed from the scent of influence or power. In light of Saudi gender segregation, Jabarti’s appointment was remarkable. My smile should have been pure joy. But the sneer in my smile was not for Saudi Arabia; it was for Japan. I was comparing my previous evening’s experience at the Little League grand celebration to Jabarti’s accomplishments in Saudi Arabia. Over 500 people attended the 45th anniversary event. It lasted nearly six hours, with an emcee, stage, spotlights, speeches and film footage from the Little League World Series in Williamsport, Pennsylvania. Guests included weighty figureheads — coaches from the best high school baseball teams in Tokyo, local politicians and Shinto priests. The VIP seating accommodated around 100, all men. The microphone delivered wisdom from more than 20 voices, all men. The stage hosted about 200 shoes over the course of the evening, all men’s — thus physically removing women from the scent of influence or power. Seeing a flock of Saudi women, huddled together and drinking thick coffee in their segregated spaces, might give Western gender-sensitive hearts a fright. Yet seeing a flock of Japanese women on a baseball diamond huddled in the service of Japanese men watching their sons play baseball would only give Western minds pause, not fright. It’s Japan, after all, we might think. Yes, they remove their shoes at the door as well — tradition, culture. I am amazed at how entrenched gender roles have been in my 11 years with this baseball community. Twelve years ago, women did not walk on the baseball field unless serving tea. And now, in 2015, we still do not walk on the field unless serving tea. No one seems to want to see change in gender roles here. And few even want to talk about it. Baseball moms do tōban once a month. Even though the word is grammatically a noun, it always translates into a verb: being on duty. It is an all-day duty. Tōban moms have to arrive before the official shūgō (meet) begins. And tōban moms cannot leave until after practice has been declared finished. Yet there are not really enough tasks to fill a whole day, so the hours become a verb. And the verb is “being.” No one questions the efficacy of tōban. One just is. Is there. Being. Zen. Zen-ing. Occasionally doing. My first time, I failed at pure tōban, pure being. I was a prisoner of the more menial verb “doing.” I was a full-time international school teacher with three kids and plenty of doing on hold at home. I was an unenlightened doer strapped shamelessly to the lowly associations of a doer’s frame of mind — associations such as “individual,” “self-interested,” “self-seeking,” “inconsiderate,” “miserly.” Yet every month I found myself being at the field. The concrete function of tōban is serving. We manage hydration via beverages for coaches and players — in case they cannot manage it themselves, I guess. And we make killer lunches. As keepers of the ice, we help with first aid. Garbage is also a specialty. And the governance of ashtrays, which includes using bare hands to wrestle with feisty cigarette butts. Finally, at the end of the day, we clean the portable toilets. During one of my first tōban days, I encountered something troubling. We had spent the morning making lunch. People ate. Dirty dishes were produced. I thought I would get a jump on the cleanup, so I hopped into the little house to start the washing-up at the sink, next to the men who sat cross-legged, bellies full, some enjoying cigarettes. Mid-scrub, I feel a tug on my pants. I turn to find a fellow tōban mom sitting demurely on her heels, looking at me with a grimace. She is sitting seiza, kneeling with the tops of her feet flat on the tatami. Very formal. For me, a little scary. She whispers that I should not wash dishes while the men are still in the little house. Apparently we are not speaking with actual voices in front of the men. Not even our indoor voices. I give her my puzzled face. She glares demurely up at me, if there is such a glare. Clearly I am to stop washing dishes. So I stop. She motions for me to lean in. I lean in. She whispers that I should sit next to her seiza-style and wait to see whether the men need anything. I give her my horrified face. She fails to read it. My heart begins to race. I cannot imagine myself meeting her request. I am still giving her my horrified face. She is still failing to read it. She gives me her demure glare. My heart races faster and I decide to depart the little house, nearly tripping on the pile of men’s shoes I have to sort through to find my own. I walk toward an open space. I find the center field fence. My breathing is labored. I find my daughter. It is the after-lunch time, unstructured and unsupervised, and there is laughter. But I will not seiza. And I will not whisper around men.